The Henrietta was the largest wooden ship ever built in South Carolina. She was 210 feet long and registered 1267 tons. She was a three-masted clipper ship. 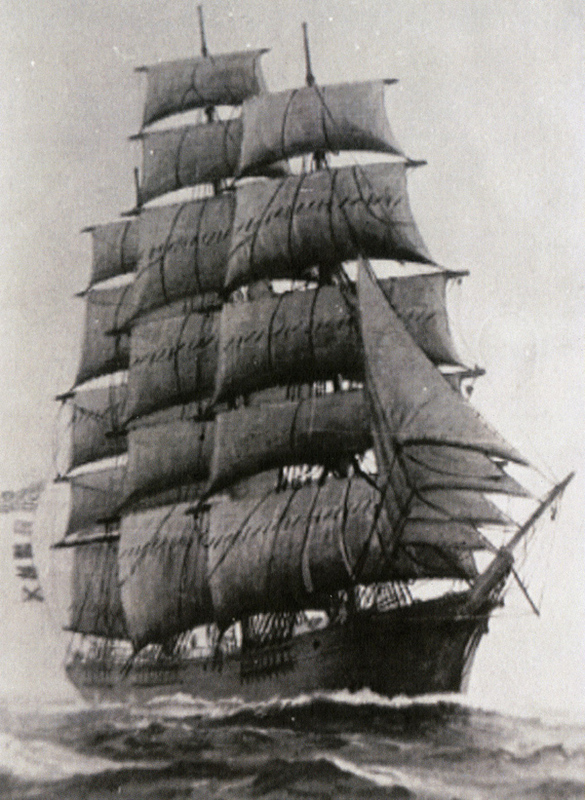 The tallest mast towered 147 feet above the deck, and she carried 24 sails. How big is that? The U.S.S. Constitution (“Old Ironsides”), which is still in the service of the U.S. Navy and docked in Boston, was only 175 feet long. The Bohomme Richard, made famous by John Paul Jones (“I have not yet begun to fight”) measured a scant 152 feet. Henrietta was gigantic by comparison. How was it that the Henrietta was born near Georgetown? It started in Maine. The Bucks were a prominant shipbuilding and lumber family that founded Bucksport, Maine. By the early 1800’s the forests of New England were not depleted but “picked over”, and choice trees were getting hard to find. A young family member, Henry Buck, went forth in the 1820’s on a foraging mission to the South to find new timber sources. On a venture up the Waccamaw River north of Georgetown, Henry began salivating when he saw the cypress swamps and the virgin long leaf pines. To a lumberman, it was a gold strike. He dropped the Buck family anchor on the spot, bought a slave, and got to work. Soon, ships were sailing past Georgetown to Bucksville and loading up with cypress and hard pine. New England shipbuilders were afraid of Carolina pine to begin with, but soon they saw that it was durable planking timber, and Henry Buck helped promote their change of heart. Buck prospered in the mid-1800’sand was reputed to be the richest man in the Horry District. He owned 300 slaves at his pinnacle, an intriguing dissimilarity to his family in Maine. When the guns sounded at Fort Sumter, Buck supported the Confederate cause with his wealth, but he did not want to see a breakup of the Union. His position wa schizophrenic, but his lumber business kept growing nonetheless. Encouraged by the success of his first vessel, it was decided to go big-time. 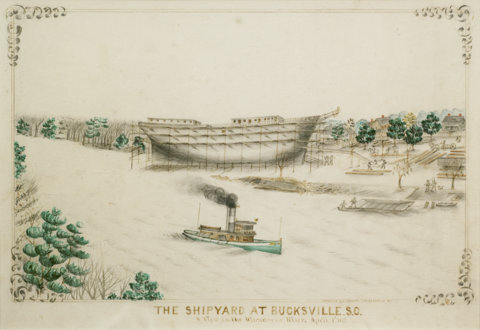 More ship carpenters, blacksmiths, caulkers, and riggers were recruited from Maine, and the result was that on April 29, 1875, the Henrietta was launched at Bucksville. She was a magnicicent vessel comparing favorably in size and quality to the best of the New England ships. However, the construction costs turned out to be somewhat higher than Maine-built boats. Also, finding skilled local workmen became a problem. A third factor dissuading the building of more big ships was the shallows encountered in getting a ship to sea forty miles away. 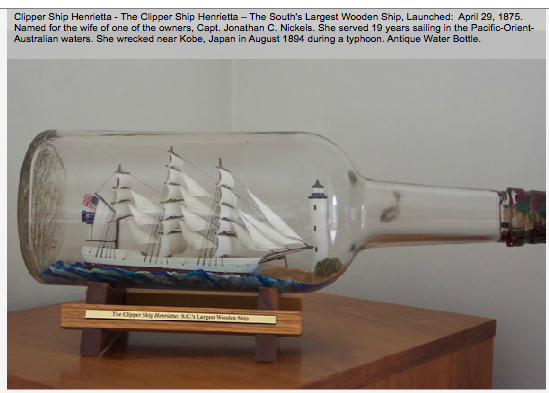 Nevertheless, Henrietta spent 19 glorious years sailing the Pacific before being wrecked by a typhoon near Japan in 1894. But Henrietta had done proud by making a big splash with her South Carolina timbers.